Contests are fun – if you see them that way! P.S. – I will be at the BNP Paribas in Indian Wells March 10 – 12. Drop me a note if you will be there as well – we can hook up on the tournament grounds the afternoon of the 11th. P.P.S. As regards respect for the opponent and respect for the game – this photo from Jim Fawcette tells it all! Yes… I try very hard to keep telling myself but without much success a lot of the time. Don’t worry about winning or losing as I prepare to serve or receiving a serve, think about the next shot, eye on the ball, split step, shoulder turn… I can only keep trying!! Once again, insightful and helpful. Well said Jim. Thank YOU!! I just got back from Indian Wells. I was lucky to see Federer and Dimitrov practice, separately. Keep your eyes open for Dimitrov, his style is almost exactly like Roger. His one-handed backhand is more explosive than Roger,s, in my opinion. Sorry i cannot go again. sorry can’t be there, as I live in Switzerland. Have a good time over there. Think of putting on your sun glasses again. Bad to be in the blazing sun without wearing them! All the best. Thanks for this valuable pod cast. I’m there on the 11th. Look forward to meeting you and your fans. Another stellar job on a very provoking issue: Why do we play tennis? Do we play for external gratification ie: the score board, my opponent, everyone watching and all my “bragging rights” friends know I won – or – for internal gratification ie: the mere act of playing my best tennis and developing /advancing my game makes me feel good..? Perhaps Michael Jordan, one of the most competitive to ever play sports taught us all a lesson with his “Love of the Game” clause, whenever, wherever he wanted to play for the love of playing he played, even when no one was keeping score. How much you want to bet when he played pickup ball he did’t need a score to confirm his skill level, nor his Love of Playing! I believe your lesson is huge, but I’m not sure I can fully break the old habits because if I do there won’t be much “bragging” left to do about my game! Just how human is that dilemma…? I’ll be at the PNB Paribas on the 10th. I would love to meet you so email me when and where. I’m a HS Coach and use your advice and pass it on to the kids. Kevin – I arrive late on the 10th and am having a meeting with this group on the 11th at 1pm in the covered area close to the scoreboards – are you there on the 11th as well? I try to say to myself before a match: don´t think about the outcome, try to play well instead! Sometimes that works…The problem for me could be: I have 15-40 against a gay I usually loose to (he serves). It could be the first game of the match. In this sitauation, I start to think about the score and that I have the chance to win the game and I play more carefully just to keep the ball inside the lines. What happens? He wins the game of course and I feel bad about not taking risks at 15-40. The he rapidly goes to 3-0, that´s a great difference for the match and for my feeling. This happens over and over for me. How do you think and play when you have two (one) breakpoint(s)? This is great advice, and whenever I leave for a match and my husband tells me to bring back a win, I always remind him that I want to bring back the satisfaction of playing well. Nothing beats the feeling of having a great match, competing well, and enjoying this splendid sport of ours. Jim, I live in Rancho Mirage, CA. I plan to be at the BNP on Thursday, March 7. Hope we can hook up. I just like to contribute by asking: what do you think about creating contest when there is a clear gap between our level and the opponent level? For example, if I am better than my opponent, there is no doubt I will win, but maybe it is a contest to win by 6/1 6/1… In this case winning by 6/2 6/2 is loosing. Like several of the other posters, I, too teach (photography, not tennis) and have for several years placed much of my emphasis on what I call ‘process’, though it seems a close cousin to ‘performance’ in this arena. In my experience, the results of a process/performance-oriented approach speak for themselves and have the side benefit of bestowing upon my students a continuously growing sense of self confidence. FWIW, I’ve found when I think only in terms of being in the moment and looking for ways to create scoring opportunities, my performance is much more in line with my skills as I know them in practice, whereas every time I mentally wander into either results-thinking or frustration the wheels begin to wobble. Thanks very much for sharing your performance insight. Excellent advice for tennis and life. Over the last year or so of rebuilding my game and finding a new group of guys who were higher level to play with to apply what I was learning, I have had a good number of opportunities to leave the court discouraged after I reverted to old habits and what I was trying to learn just did not come out at that speed of play. 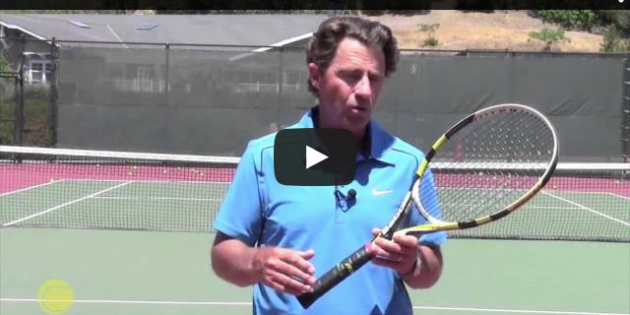 I reminded myself that this was not going to happen in a day or a week or a month, and I made notes on paper or mentally of specific items I noticed, such as getting off balance forward on my TS backhand (footwork) or dropping the racket head too far and opening it on TS forehand (two or three mechanics issues). This gave me a better target to focus on in practice. I also noted things I had done well, such as a nice TS drive or sequence at net, regardless of the outcome of the point. This let me notice things like the put away volley I got too strong on but still (luckily) landed inside the line. The focus both ways becomes the details involved — preparation, stroke mechanics, footwork, court positioning, recognition of situation. And the outcomes are getting better and better. I thank Jim very much for this suggestion. You’re right! When I am trying to win, I get up tight and am more prone to make errors. When I am more into hitting my shots with good form, good footwork, and proper finish, and not worrying about winning or losing, that relaxes me. Performance, not winning or losing. Thank you. This is just what our tennis instructor, Tom Leonard, from Fairfax Racquet Club always tells us. Rebecca – is that the Tom Leonard who played the circuit and was from USC? I often think about these things, although I do not express them like you do. I am thinking right now that point counting is set up in tennis to amplify the difference between the players. If you are just slightly better than your opponent in each game of a set then you will win 6-0. Wow, that was a prompt response! Seemingly simple, l do find your answer deep and helpful! Thanks so much, Jim! Couldn’t agree more! Thanks Jim! Do you have any tips on how to rid you mind of the outcome, if outcome really, really matters? Your comment on the mental part of the game reminded me of a short poem I was inspired to compose after blowing a match. The wind’s at my back, and a win I can savor. It’s really not hard. I’ll coast home from here. Is all that it takes to finish the job. It also involves the state of your mind. The boys have the shots, the men have the poise. You have to become somewhat Zen: the outcome does not matter. Hi…. just to say I love your tips ! I’m a 64 yr old woman who is still trying to improve ! wish I’d had the opportunity to learn to play as a child. I will be signing up to receive more info from you on my return from vacation…. in April. Many thanks…. the kick serve / 2nd serve has been great for me as I relied on this after a shoulder op. The more you want to win the outcome of a match, the more your mind wants to control the performance by helping it! That is what causes so many problems. I think the smarter you are, the more you think you can use your mind to control the situation, however as I think about it, the more I give myself a game plan, and focus on that, and not the outcome, the better I do. Or How can I just leave my mind at the court gate? I really like the concept of “Play well and the outcome will take care of itself”. I focus on the process (balance poise, court positioning, hit the ball in the contact zone and not beyond etc). This video is a good reminder for me. Thx.